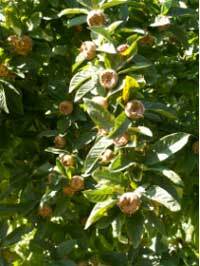 Historic Cherries, Mazzards, Nuts and Medlars etc. - Green Valley Farms - Historical Management Associates Ltd. While the older cherry trees fruit well we have a problem with birds stripping the eating varieties before they can be picked. The dates by which there is evidence of these varieties being known in England must be treated as provisional and suspect. Continuity of a name over time does not prove genetic continuity. We publish the Fruit Variety Register which contains all the illustrations or written information we could uncover with on period fruit varieties between 1580 and 1660. A new much expanded version of this tracing backwards to the earliest mention of any variety thought to exist by 1660 and forward to show continuity to the present has been started. This is currently on hold awaiting the completion of a three year project to DNA test all of the thousands of apple, pear and cherry varieties in the Nation Fruit Collection. Once this DNA is cross referenced to DNA from Archaeological sites the dating of the origins of surviving fruit varieties will need to be totally rewritten.